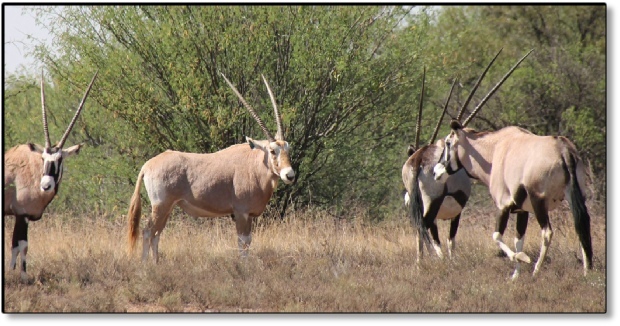 Identification: Long straight horns in males and females. Light to golden & beige in colour with golden brown on the usual black areas and tail & white markings on the legs and face. Short golden brown mane, gold brown to beige in colour continuing onto the tail. Golden brown and white face markings. All the usual black areas are golden brown in colour with white markings. Size: Shoulder height +/- 1,2m. Weight 210 - 240kg. Habits: Grazers but browse occasionally. Love dry open areas (semi-desert). They also eat tsammas and roots. Calves are born throughout the year. They are very well adapted for hot conditions and have a well-developed cooling-off system for the blood going to the brain. Distribution: Ethiopia, Somalia, Sudan, Uganda, Kenya, Tanzania, Angola, Namibia, Botswana, Western Zimbabwe and South Africa (Northern Cape).